Events from the year 1554 in India. Events from the year 1557 in India. Events from the year 1558 in India. Events from the year 1553 in India. Muhammad Adil Shah (reigned: 1554–1555) was the fourth ruler of the Sur dynasty, a late medieval Afghan dynasty of northern India. 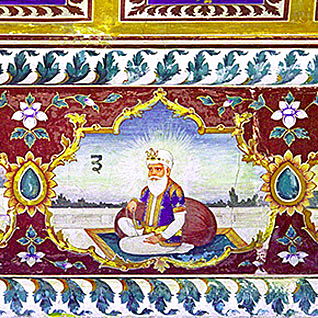 Guru Amar Das ([ɡʊru əməɾ dɑs]; 5 May 1479 – 1 September 1574) was the third of the Ten Gurus of Sikhism and was given the title of Sikh Guru on 26 March 1552. He died at an age of 95. Events from the year 1550 in India. Sikandar Shah Suri (died 1559) was the sixth ruler of Sur dynasty, a late medieval Pashtun (Afghan) dynasty of northern India. He became the sultan of Delhi after overthrowing Ibrahim Shah Suri. Events in the year 1556 in India. Events from the year 1551 in India. Events from the year 1552 in India. Events from the year 1559 in India. Events from the year 1555 in India.